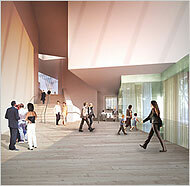 Reading in yesterday’s NYT that the Tate Modern is planning a $397 Million dollar expansion by (who else?) Herzog and de Meuron gave me a distinct sense of dejavu. Aren’t those the guys who…exactly? Click here to catch all the echoes yourself. A couple of choice bits I could not pass pulling out of the article: Sound familiar? “The novelty in the Tate Modern annex is that it will turn the museum’s face away from the river and toward the borough of Southwark.” hmm. I wonder if it’s “face” will resemble a visage as much as the new walker does? And check out this computer generated image of the new Modern interior. Hmm. Can you say townsquare?